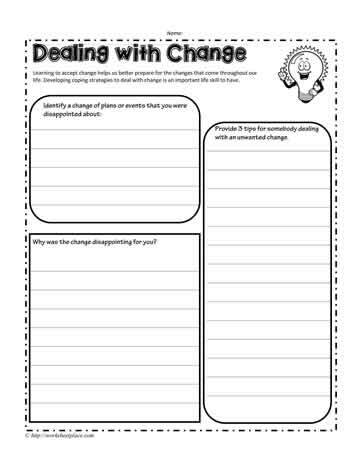 Dealing with change worksheet. Change is a fact of life, some changes are unexpected and aren't always positive, however, those who cope well with change will do well when life throws those challenges at you. Think of these types of changes, a sudden move to a new location, a break up of the marriage of your parents, a good friend who has to move away. Losing a job, losing a best friend.